Like most people, at some point in your life, you’ve been wronged in some way and you contemplated getting justice by going to court and suing. Maybe you were a victim in a car accident? Maybe you slipped and fell in a store? Maybe you were injured at your apartment after your landlord failed to fix the repairs, despite the fact that you had repeatedly informed your landlord time and time again? 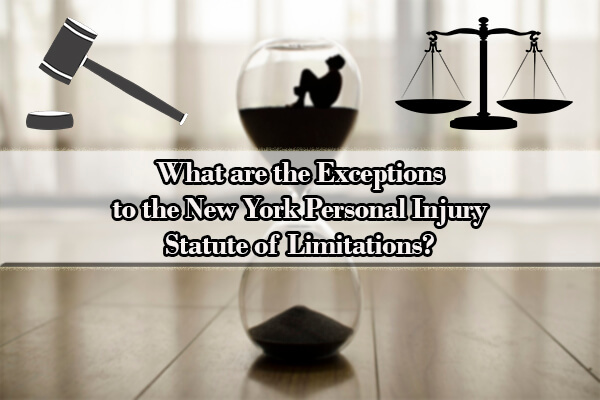 What are the Exceptions to the New York Personal Injury Statute of Limitations? Statute of Limitations NY: What is the Statute of Limitations in New York? What is the statute of limitations in NY? A statute of limitations is a statute prescribing a period of limitation for the bringing of certain kinds of legal action. This means that New York sets a time limit for when a person can sue somebody else. The importance of this, obviously, is that if a person intends to sue, they have to do so within the time limit prescribed by the New York State statute of limitations, which is the law of New York. Accordingly, a person cannot wait forever or beyond the statute of limitations to sue somebody. Furthermore, each type of legal action has their own specific and individual statute of limitations. For instance, the New York personal injury statute of limitations has its own set timeframe. In general, the statute of limitations for personal injury in NY, including New York statute of limitations negligence, is three years from the date of injury. NY Statute of Limitations Personal Injury: How Does the Statute of Limitations Work? When does the statute of limitations start? When does a statute of limitations begin? How does statute of limitations work? Generally, the statute begins as soon as the rights of the person suing have been violated. For a breach of contract, this would be the date the contract was violated. For a workers compensation claim, this would be the date of the work injury. Similarly, the statute of limitations on personal injury claims is also the date of injury. If this were a motor vehicle accident, the statute of limitations NY car accident would be the date when the collision occurred. Or, if this were a slip and fall, it would also be the date of the injury. When does the statute of limitations end? How long does the statute of limitations last? Again, the statute of limitations runs the moment the violation starts and ends precisely on the last day when the statute of limitations expires. In general, in a personal injury suit, three years is the standard time limit for New York personal injury lawsuits. So, in a personal injury case, if the accident occurred on January 1, 2019, the injury time limit would be three years and the statute of limitations would expire precisely three years later on January 1, 2022. The courts are very adamant about adhering to this personal injury time limit and personal injury claim limit and are unable to forgive or allow somebody to proceed with their suit if they do miss their statute of limitations. This is because the statute of limitations in New York, and like any other state, is state law, and establishes a set deadline to file suit. Can the statute of limitations be extended? Although, in general, the courts not only will not, but also cannot extend the statute of limitations, in New York, there are some exceptions for when the statute of limitations can be extended and in which certain events and facts “toll” or delay the statute of limitations. When can statute of limitations be extended? One exception is the discovery rule. Under the discovery rule, the statute of limitations doesn’t begin until the injury is actually discovered. For example, in a breach of contract case the statute of limitations is normally six years. However, even if the breach might have occurred more than six years ago, but you only discovered the breach recently, the statute of limitations would occur on the date you first discovered the breach. Or, for example, in a personal injury, let’s say you have been exposed to asbestos by your landlord while you were a renter. Again, the statute of limitations for a personal injury is normally three years. While you were a renter, you warned the landlord to fix the apartment, and he told you he had. More than three years later, you aren’t even living at the apartment anymore, but you’ve developed a lung condition that the doctor says was due to asbestos exposure while you lived in that apartment. Accordingly, even though it is now more than three years since you were exposed to the asbestos, the statute of limitations would start when you first discovered your injury. Another example is when the person suing or injured is a minor. In New York, since minors are considered as not having the same ability to comprehend matters as an adult would, the statute of limitations usually tolls for them until they hit 18. Under New York law, a minor ordinarily has three years from the date of his or her eighteenth birthday to commence litigation. However, for medical malpractice actions, the statute of limitations cannot be extended for more than ten years from the date of the act or omission giving rise to the injury. Lastly, another example would be a worker’s compensation claim. Again, you may be a laborer who constantly uses vibrating tools. While employed, you notice that your hands begin to become numb and you report your injury to your supervisor. The numbness gets so bad that you end up quitting your job and take a new job. Not wanting to make waves or unsure of your rights, you trudge onward and just live your life the best way possible and just deal with the pain. Many years go by and finally you see a doctor for your hands and are diagnosed with carpal tunnel syndrome and the doctor says it first started at your original job when you worked with the vibrating tools. In this type of scenario, the statute of limitations would begin upon discovering or first being diagnosed with carpal tunnel. So, can the statute of limitations be extended? Yes, upon discovery of your injury. However, it is best to consult an experienced attorney to determine when, according to our own unique set of facts and circumstances, your statute of limitations would begin and end. 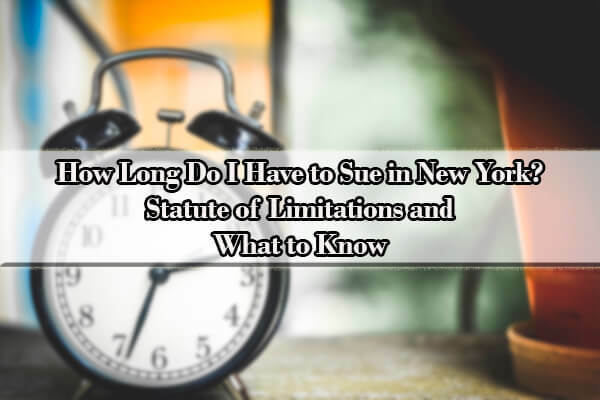 In New York, every legal violation has their own unique set of statute of limitations and criteria of how long you have to file before your statute of limitations expires. Accordingly, it is always best to consult an attorney to determine what type of legal action or lawsuit you possess, when the statute of limitations begins and ends generally, and if there are any exceptions to the general statute of limitations that apply to you. Attached is a table outlining in general what the most common types of lawsuits that are filed in New York and their accompanying statute of limitations in general. Q: Is there a statute of limitations on personal injury? A: Yes, each legal action or violation or lawsuit has its own unique and individual statute of limitations. Please see the Bonus: Statute of Limitations Table above to learn more about the most common lawsuits and their statute of limitations. Q: How long is the statute of limitations in New York? A: One of the most frequent lawsuits that people file and sue for is liability cases in which they allege that the other person caused their accident or injury, or were legally “negligent.” These types of cases often occur when the person suing was physically injured or sustained some type of bodily injury. Examples of this include motor vehicle accidents, slip and falling at stores, being injured on somebody else’s property, etc. In New York, the statute of limitations for negligence cases, in general, is three years; however, there are exceptions to this three years depending upon when the person suing discovered that they were injured. It is always recommended that you consult with an experienced personal injury or liability attorney to review your options. Q: What is the statute of limitations for negligence in New York? A: Again, the statute of limitations for negligence in New York is three years. See table. Q: How long can you sue for personal injury? A: In general, the statute of limitations for a personal injury suit is three years. This means that you have three years from when you discover your accident to file your lawsuit. Normally, this discovery is the date of the accident itself; however, there are exceptions under the discovery rule. 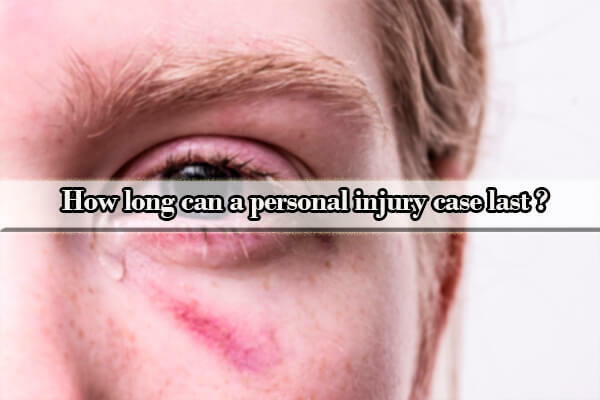 Q: How long can a personal injury case last? A: Once your lawsuit is filed within the statute of limitations, you don’t have worry that your statute of limitations will expire and that you will not be able to proceed with your lawsuit However, just because your suit is filed does not mean that your lawsuit will be resolved in the near future. Each personal injury case is different and there are a number of factors that are taken into consideration for determining how long a personal injury suit will last. The two most important factors are liability and damages. Liability means the degree to which the person who you’re suing is liable for your injuries. Just because you were injured does not automatically make the party you’re suing liable. Liability, in general, is based upon negligence, and you have to prove that the person you’re suing is negligent in order to recover. For instance, when it comes to statute of limitations NY traffic violations, if there was a motor vehicle accident in which you were injured, but the other driver was not ticketed for any moving violation, proving liability may prove difficult. Similarly, even if the person was ticketed technically and you were not, but the police report is not very clear that the other driver committed a moving violation or suggests that you may have been at fault too, even though you didn’t receive a ticket, proving liability may also prove difficult. The second factor is damages or New York State pain and suffering. Damages is the degree to which you were injured. This is a combination of bodily injuries you’ve sustained, permanent disability, and lost wages. Accordingly, even if you may have experienced a lot of pain, but had very limited medical treatment, that may affect your damages. Similarly, you may have over $100,000.00 in medical bills, but if the bills are more for testing and are diagnostic in nature and your actual diagnosis is minimal, then that also may affect your damages. As such, depending upon the facts, your personal injury suit may last only a couple of months to several years after it’s been filed. Q: Can you sue after the statute of limitations has expired? A: There are exceptions to the statute of limitations. The NY statute of limitations for a personal injury suit is normally three years from the accident date. Consulting an experienced attorney is best to inform you what your rights are under your unique set of facts. Q: What is the average settlement for a personal injury? A: Every personal injury lawsuit is different. The two most important factors in determining how much a case is worth is establishing liability and damages. The better evidence you have in establishing liability and that you have good damages, the better chances you’ll resolve your case sooner and also the higher the settlement will be. Understanding the law is difficult especially knowing exactly your statute of limitations begins and ends and if any exceptions apply. This is especially true when it comes to personal injury lawsuits and cases involving negligence, liability, and where physical injuries are involved. 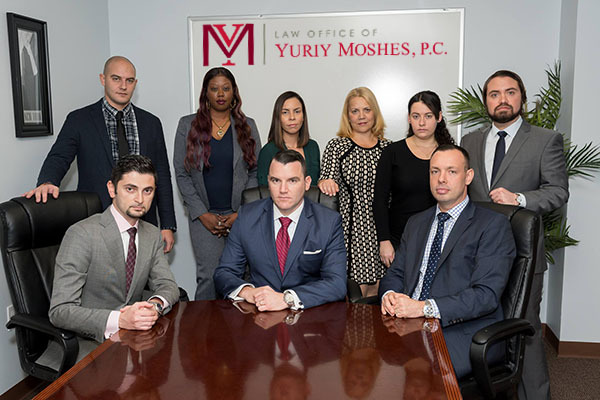 At Law Office of Yuriy Moshes, we are experienced in such matters, especially when it comes to New York statute of limitations negligence and NY statute of limitations personal injury. We represent all types of injured parties in the greater New York City area including all its boroughs, including Manhattan, Brooklyn, Queens, the Bronx, and Staten Island) as well as Northern New Jersey, Long Island, and Upstate New York. If you’ve been injured and are seeking money damages, you need to consult with an experienced and knowledgeable attorney to advise you on these matters. We provide a free consultation.